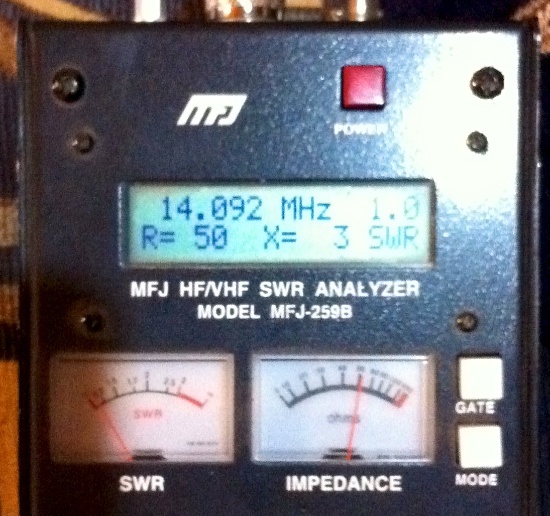 Old mate Ross, VK1UN, is currently stationed in Somalia and Mogadishu where he runs WSPR. In calls via Viber he described an HF loop built from heliax and hose clamps that he's been building and I asked him to send me some photos. "I've been corresponding with Myles VK6ZRY a lot as he has been using a magloop for quite some time now, another notable maploop users on WSPR is Peter DL6NL who has used a loop now for about 2-3 years, maybe earlier (let me check my email). yes, I have email re his loop going back to March 2009, indeed he sent me a photo of it suspended in the horizontal mode over a table inside. Peter typically runs about 200mW on various bands. 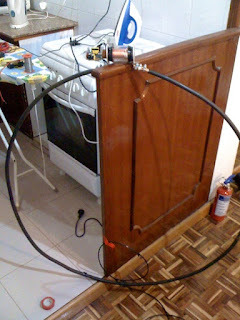 I really would like to have a mag loop running on 160m so that I can use WSPR on 160m without having to put up 150m of wire, which is not practical in Mogadishu but a 3m diameter loop supported on plastic water pipe, would be. Also the magloop is very narrow in bandwidth and also very sharp in the plane of the loop, one can null out noise sources very easily. "I'm beaming to….." takes on a whole new meaning with a magloop, indeed it is bi-directional and, if supported close to the ground, the direction of best radiation is up at, perhaps, 45 degrees from the horizon. Loop currents at resonance are quite high -30 amps in a 3m diam loop on 160m and the voltage at the capacitor can be 5 KV or so and that's why I was seeking a decent vacuum variable, both high voltage and high current. This means I can run up to 75W on a 3m loop with a 4KV capacitor as 100W would mean 5.048KV at the capacitor, still I do not expect to use 75W WSPR too often. 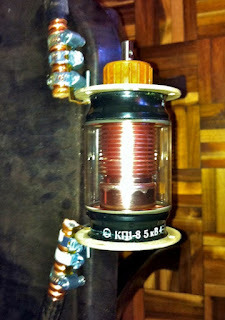 50W, yes! Mind you, a quick calculation for one of three magloop calculating programs shows that even 75W would be 4.372KV at the capacitor! There are a few programs that will calculate loop performance and needed capacitance as well as voltage current and a number of other parameters from circumference, diameter of element, frequency and power, these are very useful modelling programs that will calculate for circulator, octagonal and square configurations. Loopcalc, RJELoop and magloop4 are three that I use. The main issue in Mogadishu will be salt corrosion on the copper tube and capacitor, so I am using plastic coated Heliax which gives slightly different readings from the programs, I guess due to the dielectric effect on the plastic covering, of course that will provide corrosion protection, I have just bought a plastic lunch box/refrigerator box to put the vacuum variable and ends of the loop in to protect from the salt air. The antenna will only be about 300m from the water's edge and in the evenings there is a nice sea-breeze, cooling down everything but bringing lots of salt to corrode! I have a Flex-1500 but unfortunately the Atom N570 powered netbook has just not got enough oomph to successfully run WSPR, PowerSDR, USB transfer AND decode the spots. Even just running the netbook and an analogue transceiver I do not get anywhere near the number of spots I get if I use the MacBook and the OS X compiled WSPR. To successfully run PowerSDR, WSPR, get USB working properly AND decode, I would probably need a quad core or even a Core i7 and 2-4GB of ram. I just wish PowerSDR was also written for OS X". Great work Ross! That's a very nice vacuum variable capacitor you have there. I like the fire extinguisher close by.